HAPPY THANKSIVING! KEEP A LOOK OUT FOR NEXT WEEKS NEWSLETTER TO SEE HIGHLIGHTS AND PHOTOS OF THE 2018 NUTS AND BOLTS EDUCATIONAL CONFERENCE! Please note: the PSAI office will be closed Thursday and Friday in observance of the holiday. 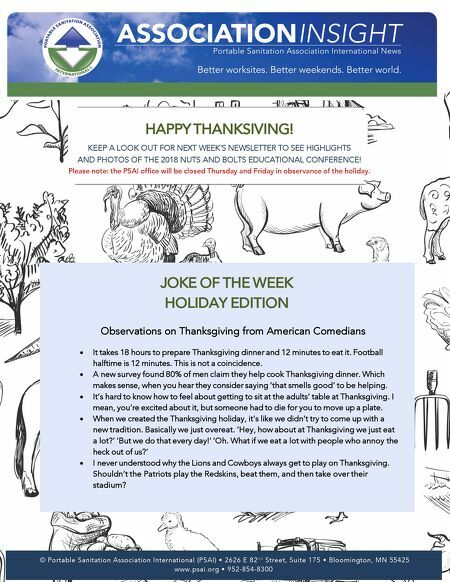 © Portable Sanitation Association International (PSAI) • 2626 E 82 n d Street, Suite 175 • Bloomington, MN 55425 www.psai.org • 952-854-8300 JOKE OF THE WEEK HOLIDAY EDITION Observations on Thanksgiving from American Comedians • It takes 18 hours to prepare Thanksgiving dinner and 12 minutes to eat it. Football halftime is 12 minutes. This is not a coincidence. • A new survey found 80% of men claim they help cook Thanksgiving dinner. Which makes sense, when you hear they consider saying 'that smells good' to be helping. • It's hard to know how to feel about getting to sit at the adults' table at Thanksgiving. I mean, you're excited about it, but someone had to die for you to move up a plate. • When we created the Thanksgiving holiday, it's like we didn't try to come up with a new tradition. Basically we just overeat. 'Hey, how about at Thanksgiving we just eat a lot?' 'But we do that every day!' 'Oh. What if we eat a lot with people who annoy the heck out of us?' • I never understood why the Lions and Cowboys always get to play on Thanksgiving. Shouldn't the Patriots play the Redskins, beat them, and then take over their stadium?